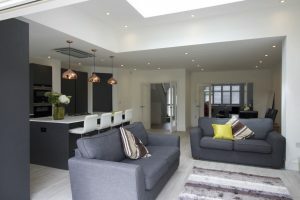 The client wanted to extend their semi-detached house, to create a large open plan ground floor, this required a wrap-around extension (to the rear and side) the project also included a loft conversion. The required work need a party wall agreement with the neighbouring property. EB worked with the client’s architect and we provided the structural engineer. Wrap around extension required steel box frames to maintain the integrity of the load bearing walls. Many of these requirement are typical elements needed for an extension. The project has created a beautiful kitchen and family room flooded with natural light.